Hi, everyone! Today I want to share some of my favorite brands that do more than just create and sell awesome products. Things like being cruelty-free, organic, naturally derived, giving back to the community, etc. I don’t exclusively use these types of products but I do feel good about using them and incorporating them into my routines. Ecco Bella is a brand that I just recently discovered. 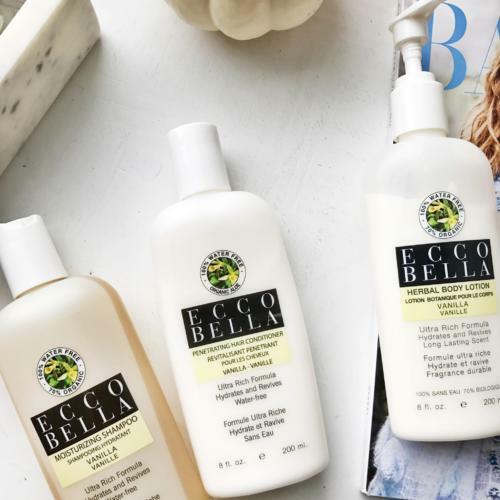 They are cruelty-free & all natural, “At Ecco Bella, we are inspired by compassion for all living beings to create products that beautify and protect our customers and the planet.”. The founder of Ecco Bella is a member of Friends of Animals, a voice for the rights of animals. Every month Ecco Bella plants trees through American Forests (link to more info). Another brand that I just recently came across was GLOW for a cause. Every time you purchase something from Glow they give back 5% to their non-profit partners. One of the companies Glow works with it Cowgirls vs. Cancer which helps women with breast cancer. Another one is MaxFund Animal Adoption Center which is a true no-kill animal shelter in Colorado, you can learn more about the adoption center here . There are many other organizations GLOW for a cause works with including a drop-in center for homeless and a mentoring program, read all about them here. I am currently using their shampoo, conditioner, and body lotion in the vanilla scent. I’ve never used a natural or organic hair products before so I didn’t know what to expect. The shampoo and conditioner leave my hair silky and shiny, I feel like I can go an extra day in between washing it too. They are both water free, the water was replaced by aloe vera. Both products are vegan, gluten-free, and 70% organic. The body lotion, also in vanilla, is water-free, 70% organic, naturally-preserved, gluten-free, & vegan. The lotion leaves my skin naturally smooth and I love the long-lasting light scent. I linked the products above and you can also shop at EccoBella.com. Glow has a few a number of luxury pampering type of products from candles to perfume including a wonderful body butter. It’s thick, hydrating, and luxurious & it smells like a dream. You can look at their products here, I like the sets so you can try out more than one thing. Nourish Organic is a brand that I’ve used and loved for years. I have used a ton of their products and haven’t been disappointed in any of them. Nourish is USDA organic which means they have been approved by the United States Department of Agriculture to be 95%-100% organic. Their products are also vegan, gluten-free, and cruelty-free. Nourish Organic gives back: “We work closely with and contribute to a number of organizations and charities including The Women’s Center, Association for the Blind, City Rescue Mission, Meals on Wheels, and the Salvation Army. We support local sports teams, schools, and Big Brothers/Big Sisters, and regularly donate our surplus materials and products to World Vision. We’re particularly proud of our donations to overseas U.S. military personnel, and of our efforts to provide aid to the victims of the 2010 earthquake in Haiti.” (taken from this page on their website). Moisturizing Organic Face Cleanser : Love this love this love this. It’s a super light cream cleanser that foams really well. This is fragrance-free and loaded with vitamins and antioxidants. Refreshing & Balancing Face Toner: Again, something I often repurchase, this is a rosewater & witch hazel toner and is perfect for refreshing your skin after cleansing. Lightweight Moisturizing Face Lotion: This has to go in my all-time top 3 face lotions. I first tried this years ago as a sample and fell in love right away. It’s super lightweight and perfect for under makeup, plus the rosewater scent is to die for. Juice Beauty is my pick for makeup. Juice Beauty is a vegan and cruelty-free brand. They have sustainable company practices like recycled boxes and using soy ink. They give and have partnerships with The Breast Cancer Fund, EWG, and the Representation Project. They do not use Parabens, petroleum, pesticides, propylene or butylene glycols, phthalates, sulfates, PEGs, TEA, DEA, GMO, silicones, gluten, artificial dyes, or synthetic fragrances. Their products are full of Vitamin C and fruit stem cells, vegetable hyaluronic acid, peptides, algae, grapeseed, and natural essentials oils. You can read more about their organic formulas here. Stem Cellular CC Organic Cream: I am a HUGE fan of BB and CC creams. This CC cream is anti-aging, skin perfecting and SPF 20. Luminous Lip Crayon: The crayons are super smooth, creamy and pigmented. Satin Lip Cream: These are my fav Juice lippies. These are super hydrating, creamy, and pigmented. Liquid Lipstick: The liquid lipsticks are a nice change from all the matte lippies, these again are super pigmented and very comfortable on the lips. Sheer Lip Gloss: These are perfect to have in every bag, it’s a sheer natural looking gloss that has some super good ingredients. I love these also because they’re super soft feeling, not sticky. What are your favorite picks for natural and organic beauty? I love learning about new brands, share your fav in the comments! If you liked this post, Brands With A Purpose | Body, Skincare & Cosmetics, you’d love my review on Nourish Organic products. I’m obsessed with hunting down ethical beauty brands – I’ve never heard of these ones before. I love Burt’s Bees and am loving using organic coconut oil for moisturising – it’s magic! These are definitely worth checking out! I also love love love Burt’s Bees, especially the Baby Bee products. I use coconut oil every.single.day.